Our signature slow-braised Turkey and Beef Bone Brews are made from animals humanely raised on organic, open pastures. We use only premium knuckle & marrow bones; beef bones are from animals grass fed and finished. Our Brews are made the old fashioned way - roasting, then simmering the bones for more than 30-50 hours to extract maximum favor and nutrients. We use real apple cider vinegar and water purified by reverse osmosis to ensure the best possible product. We add a touch of ginger & turmeric to all Brews. Our brews are frozen immediately from the kettle to preserve the freshest product. Brews can be served as refreshing lickable “brothsicles” or thawed and served as a warm, nourishing snack in-between or for topping/rehydrating meals. Ingredients: Real Beef Bone Broth made from Premium Marrow & Knuckle Bones and Purified Water, Turmeric, Ginger. 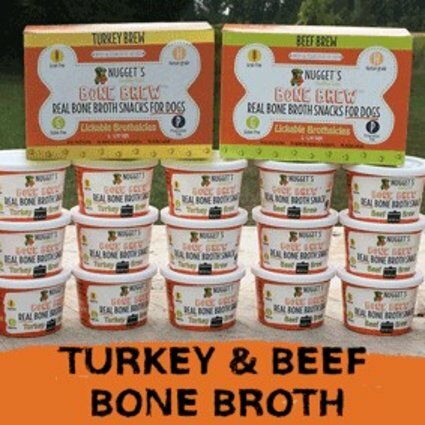 Ingredients: Real Turkey Bone Broth made from Premium Marrow & Knuckle Bones and Purified Water, Turmeric, Ginger.